No eggs? No problem. This easy Vegan French Toast is delicious made with almond milk, cinnamon, nutmeg, maple, nutritional yeast, and a little flour. The first year Jack and I were together, he was working in Austin while I was finishing college in Chicago. He’d come visit me nearly once a month. It feels like such long time ago now (11 years, yikes)… many of those early memories are fuzzy, but a few stand out. Friday nights, I would take the blue line to the airport to “pick him up” and we’d ride back to the city together. I was always late, he was always mad (or madly in love, ha). Saturday mornings, we would head to the Pick Me Up Cafe where he would read The Onion in print (back then I think they only distributed it in Chicago), and I would eat vegan French toast. He’d read me funny headlines and I would ramble on about how this French toast couldn’t possibly be vegan. It was that good. This one is close, or maybe better. Even Jack was surprised it didn’t have eggs. I used vanilla Almond Breeze almond milk, millet flour, nutritional yeast, (which seems strange, but it gives it that eggy essence), cinnamon, nutmeg, and lots of maple syrup. I loved it with chewy ciabatta bread, but this vegan French toast would also be gluten-free if you sub in gluten-free bread. Make this vegan French toast gluten-free by using gluten-free bread and certified gluten-free flour. 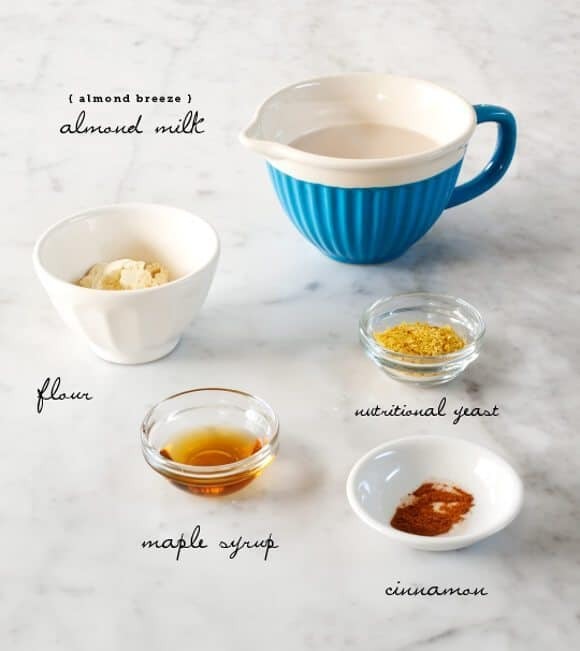 In a small bowl, whisk together the almond milk, maple syrup, flour, nutritional yeast, cinnamon, nutmeg and salt. Place the bread in a shallow dish (with sides) that holds all of the bread. Pour the mixture over the bread, then lift or flip the bread over to make sure both sides are evenly coated. Heat a drizzle of coconut oil in a large skillet over medium heat. When the pan is hot, add the bread slices and cook for a few minutes per side, until golden brown. Serve with powdered sugar, a dab of vegan butter, maple syrup, and fresh fruit. *It's very important that you get good sturdy bread. I used thick slices of ciabatta from the Whole Foods bakery. Please please do not use wimpy sandwich bread or your french toast will be soggy. *nutritional yeast is not the same as baking yeast. Look for yellow nutritional yeast flakes in the bulk bins of your health food store. I used to have this image that popped into my head every time I heard the word “vegan”, something like the restaurant Tina Fey goes to in Baby Mama, where the food is just dough that’s alive and weird. I quickly learned this is not the case at all, and this french toast is further proof! I don’t follow a vegan diet, but I can’t wait to try this recipe! I’m a big vegan french toast fan! 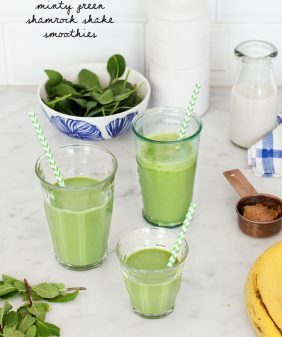 I’ve made it with pumpkin puree, using bananas and even using Sunwarrior in the mix! Ripe banana made a great sweet batter! That seriously looks so incredible! I definitely need to try this since my dairy allergies have gotten worse. You’ll be happier when you try different vegan recipes, especially the ones that re-do the old classics like mac n cheese, shepherd’s pie etc.! After a while you can veganize anything. I have, but some recipes are definitely better if you look up the ones done in a test kitchen or so as I tried veganizing lasagna and it definitely tastes better if ya follow one of those fancy recipes done by famous vegan chefs, then if you just use gimme lean vegan sausage for the meat and daiya cheese for the cheese. Those things by them selves are awesome, on pizza or for breakfast, but didn’t work for lasagna somehow. My vegan friends like it though. This looks amazing!! I miss delicious perfect bread like that, every one in a while. This is one of those times. No gluten-free bread has every looked like that 😉 Love that first photo with the syrup being poured! So beautiful. If you can ever try the baguettes from New Cascadia Bakery in Portland, Oregon, you would see that gluten-free bread can indeed look like that! I just made french toast with it this morning. 🙂 It was scrumptious. I don’t really get on with eggs so I’m excited to try this version! I’m so excited to try this recipe!! I’ve attended a lot of brunches lately and wondered how to create a vegan version of this classic dish. Thanks for sharing! wow! this sounds so good. i always wondered how one could make eggless french toast. I normally don’t go out of my way to eat anything vegan, but this recipe looks really delicious. I might just have to try my hand at some vegan french toast! Another stunning photo…and delectable sounding recipe! 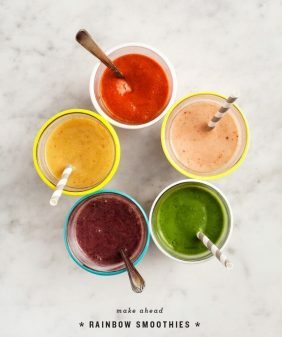 I pinned it onto Delicious Karma’s Pinterest Breakfast Board so I can come back to it this weekend to make it! I’m not vegan, but this recipe really sounds terrific. This looks to.die.for. I am the biggest french toast fan ever! I’ve made a vegan french toast before using well-mashed banana [+milk/cinnamon] instead of egg. It’s pretty “eggy” when all mashed up. It worked really well and even formed a nice crust! Love your rendition with the millet flour and the light in these photos is so bright + cheery. Perfect for breakfast! 🙂 Continue to love all that you do here! 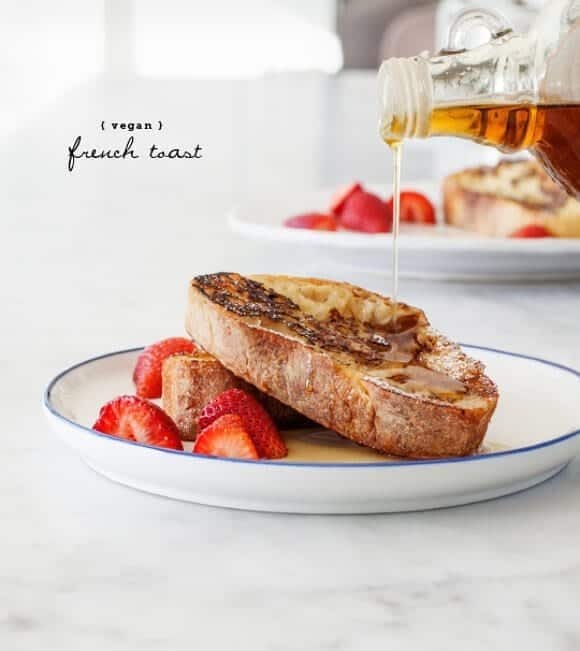 I am not vegan but I would definitely try this recipe out for French Toast. Its currently raining and cold in Sydney so this would be perfect this morning. Yum!!! I love the fact that you managed to make vegan French toast without the need for a flax or chia egg (I am not a huge fan, though I do appreciate the ‘binding’ qualities and the nutritional benefits). I already buy Almond Breeze and it’s a pretty yummy almond milk when I don’t have time to make my own. Thanks for sharing this gorgeous recipe… your photos of the gorgeously chewy, pillowy bread with its crispy crust and the soft dusting of powdered sugar are drool-worthy! I’m going to dork out for a minute and just gush about how much I love this here blog! 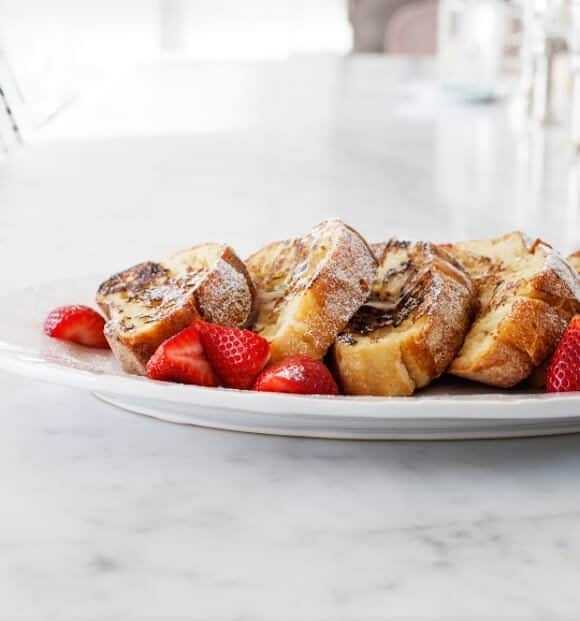 Your photos are phenomenal, and seriously… this french toast!? I’m in love! This looks heavenly!! Oh man I want some!!! Beautiful! These photos are beautiful! If I could eat this I totally would. Not exactly gluten-free, but my mouth is watering! FYI…The Onion was founded in Madison, Wisconsin. Headquarters are now in Chicago, and the paper is distributed for free to many cities including Denver, Austin and Santa Fe! Yum, looks so good! Thanks for sharing. This is gorgeous! Love this recipe!! What a cute story, it’s no wonder he was ‘madly’ in love. I can’t imagine you ever being late to anything, you’re way too detail oriented. It must have been the train’s fault, right? Right? Great looking breakfast spread! I love this idea! So many of my readers are not only gluten-free, but dairy-free or vegan. I think I’ll try using tapioca gel (a mixture of tapioca flour/starch and water) along with gluten-free bread to create a dairy-free gluten-free version. Thanks so much for the inspiration. I love your blog! I found you via Huffington Post’s article on Food Bloggers: The top 10 of February. I’m not a vegan but your picture looked so delicious that I want to have French toast for breakfast this weekend. It’s been a while since last time! I’m not vegan but it’s always nice to have an alternative, especially when you don’t have certain ingredients on hand. Can’t wait to try this when I’m off my self imposed starchy carbs ban. Love the container of the almond milk on the picture. Thanks also for having so many vegan recipes lately, so I don’t have to veganize them. Thanks, I really love it too :). I’m trying to bake less with eggs, which I find to be the hardest part. Love to see vegan recipes on your beautiful blog – keep ’em coming! This looks incredible, btw. This is a great vegan recipe! I have made some vegan french toast without applesauce and fruit juice, it is delicious. Check it out. oh my goodness this was amazing (as with all of your recipes!). I even made a little post celebrating it! thank you for the vegan recipes–i love them! This is a very good recipe. Thank you for posting it. I just made it this morning, with vegan cinnamon-raisin bread. It was delicious. ooh that sounds delicious, glad you liked it! I cannot tell you how excited I am to have found your amazing site! I am what I call a half vegan (very strict vegetarian, no eggs, but still eat cheese) and my boyfriend is a meat eater but likes to experiment with health food with me. I made him this vegan french toast for his birthday yesterday and he loved it so much we made it again today. So happy I found all your beautiful, healthy, unique, but somewhat easy recipes! Sometimes it’s hard keeping variety in vegetarian meals (especially with little time) and these are awesome… Thank you! Thanks! So glad you’re finding some inspiration (and some variety!). So funny, I’m the opposite – limit cheese, but I eat tons of eggs. But I try to bake without eggs just so I can post things everyone can enjoy. I’m vegan and made this for my girlfriends birthday today! It was amazing, best french toast I’ve ever had. Thanks so much for the recipe! I found you by looking for vegan french toast, and just tried this yumminess!! The nutritional yeast was a little strange at first, but once I added some syrup and fruit it definitely did add a little balance to all the sugar. I recently had some v. french toast with orange extract in it, and I think that would go AWESOME in this too, maybe hide the nutritional yeast a bit but also still let the flavor be there?? Thanks so much for sharing! Hi Christina, glad you liked! If you felt like it was too nutritional yeast-ey, you could also just add less (or omit and add a little salt to balance…). I think the extract idea sounds wonderful! I just made this with left over vegan challah. 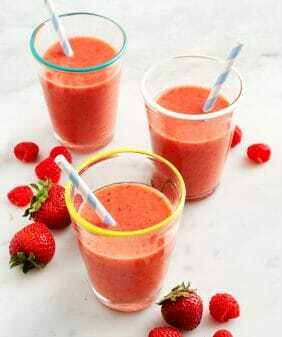 Amazing – so easy and so yummy. I had unsweetened vanilla almond milk and I wasn’t sure what type the recipe called for so I doubled the maple syrup in the recipe. (I like to err on too sweet!!!) It was a big hit! I missed grocery shopping day yesterday and had run out of our normal breakfasts for my 2.5 year old son and I. We did have half a leftover baguette in the fridge and a little single serve box of soy milk, plus the other staples, so french toast it was! So glad Google brought up your recipe, it was really delicious but even better, it was SO easy. I think I see more french toast in our future!! I’m so happy to hear, thanks for sharing! Just made this and it was soooo good! Used plain soymilk and still delicious! Thanks for the recipe! I just made this. I can’t say it rocked my world but the end result was still decent enough. I’d try again with a softer bread. And at least I now know vegan french toast is possible! 🙂 Giving up animal products is so much easier than many people can imagine. I once was one of those “no way, no how” people. My husband is vegan but I am not. I’m always looking for vegan recipes that we’ll both find delicious–which is particularly difficult for breakfast. This is hands down the best vegan french toast recipe EVER! It is easy to make, beautiful to plate, and absolutely delicious. It’s like a party in my mouth that I never want to end! Thanks for sharing this recipe with us. I have been making this weekly for a couple of weeks and everybody in the house LUVS it even has a leftover the next day.. I do not even want to imagine what was my breakfast 11 years ago. It probably contained a lot of bacon, eggs, among other ‘healthy’ food. It is nice that you have been a vegan for such a long time, and it serves as an evidence that people can really become lifelong vegans. Your recipe looks delicious. I believe I have tried something very similar on the Winterlicious food festival, although I do not remember if it contained some eggs or not. I’m slowly changing to vegan, so I would like to try your recipe without eggs or other non-vegan ingredients. I hope that baking it will be as easy as with eggs. This looks wonderful. I would have to have a side of bacon with mine. This was fantastic! Thank you!! 🙂 I really missed french toast since I recently found out I cannot tolerate egg! Yum! Hi Natalie – I’m so glad you liked it! This is by far the BEST vegan french toast recipe I have ever tried, and I have tried many!! Tastes the most like “traditional” french toast. Thank you!! 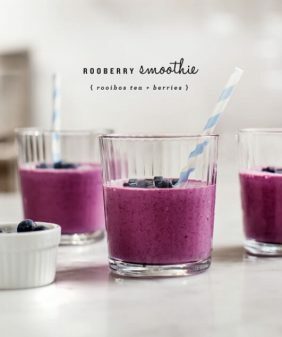 Tried this recipe this morning and was so simple & delicious! Hi Danielle – so glad you liked it!! I first had this when my husband made it for me for a surprise breakfast. We have made it countless times since then and every time it is incredible. Many of our non vegan family members have since raved about it. Thanks for sharing this recipe. I made this tonight and was very pleased! Very simple. I did not have maple syrup so I used cane syrup and agave and it worked out fine (though probably not the way the recipe is intended to taste. I recommend! I have already commented on how great this recipe is but need to add that since then I have made it countless times for others visiting, non-veg eaters and it is still a hit. No one believes me when I say it is vegan. Also, my 11 year old, who used to hate french toast frequently requests I make her french toast now that I use this recipe! Thanks!! I seriously thought there was no way this would taste remotely like french toast, but it honestly tastes better! This is my new favorite breakfast recipe, hands down!! awsome recepie! can I make the mixture the day before and keep it in the fridge over night and toast the bread the day of? Hi Shaya – yes, the mixture should be just find overnight in the fridge. Will this recipe work with regular milk? I can’t use almond milk. Thank you thank you thank you … for someone whose body has decided to stop properly digesting eggs and dairy, I am grateful. I thought this was one food I wouldn’t be having again. It is delicious. I am excited to try this recipe for Christmas morning when my daughter and her boyfriend are visiting from Washington DC. Thank you! And I LOVED the Pick Me Up Cafe when I visited there last time I was in Chicago. Seeing all those vegan options on that huge menu was enough to make me dizzy with happiness! ha, it was a favorite of ours, for sure :). I hope you have a lovely christmas morning! 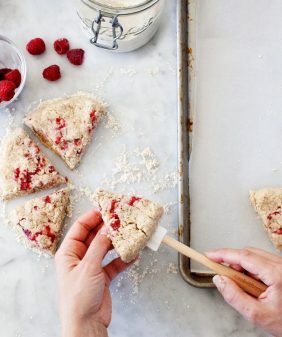 Do you think this would work with normal, all-purpose flour or whole-wheat flour? Or does it need to be millet flour? I made this for brunch yesterday, using soy milk, whole wheat pastry flour, butter in the pan and the neighborhood’s best sourdough bread. Needless to say it was a big hit and the table got very quiet as my guests devoured it. Thank you! Hi David – ha, I’m so glad it was a hit! Thanks for coming back to let me know! I just used your recipe and it was soooo delicious. Thank you for sharing. This will be a stable in my weekend meals. Hi is there a substitute for the yeast? Where I live in England we don’t have any health food shops, nor do I have much money to order it online. Hoping to make it for Valentines Day though! Not as good a flavor as vegan French toast with a banana base. The flavor isn’t bad, but it’s kind of bland. Cutting the bread extra thick seemed to help keep the bread from staying soggy, too. I didn’t really care for the nutritional yeast after taste, either. I loved the use of the coconut oil for cooking, though. I’m notorious for burning oil in the pan when I make pancakes or French toast. The higher smoke point (?) of the coconut helps prevent that–plus the flavor is great! Thank you for the recipe! Where would the best place to grab these ingredients be ? Safeway? Trader Joe’s? Whole foods ? 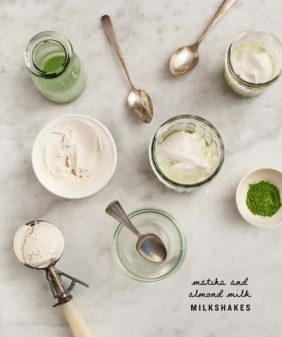 Hope to make this for my vegan girlfriend soon ! Hi Anthony, you should find everything at Whole Foods and probably also at Trader Joe’s. Thanks! I actually went to safeway last night and managed to find everything there. Except the nutrional yeast. But I made it for her and I this morning and we both loved it. I surprised her with it. It was good without the yeast but I do wanna try with it :). Thank you for the recipe !! Thank you :). She began the transition to becoming vegan 3 weeks ago and she’s been making a lot of vegan meals. I just wanted to show her that I support her as well. i was just going to start maintaining a vegan diet and was wondering if you knew any other healthy breakfast ideas? and i was wondering if this was considered ‘healthy’? Hi does anyone know if I can use normal bread? Had made some fresh almond milk and so used it and the almond pulp instead of flour. So delicious! Thanks! sorry this one didn’t work out for you. This was delicious! I was worried about the nutritional yeast as it can sometimes be an overpowering flavor, but it was perfect in this recipe. I made it exactly as written (using spelt flour) and sourdough bread. So good! Thank you! I guess you already heard that this recipe is great, but I want to say it as well. OMG OMG OMG! this was so delicious!! I served it with powdered sugar, maple syrup and a homemade raspberry&blackberry sauce. I shared a link to your recipe in our facebookgroup for Dutch vegans, cuz they need to eat this as well. thanx for sharing! yay!! I’m so happy to hear that you loved this!! Thank you so much for sharing too! I’ve been craving french toast lately, especially since I found some vegan, gluten free “Texas” toast. This sounds much better than the way I’ve been making it. Thanks!! Wonderful recepie! Just made it this morning and loved it. I actually used it with killer daves brand organic bagles due to not having any bread :p and it actually turned out fantastically! ha, so glad it worked just as well with bagels! Thanks for coming back to share! This looks like the perfect french toast! Amazing! Tried this recipe and it turned out really good. Thanks for sharing it. After watching “What you eat matters 2018 Documentary H.O.P.E.” Last night, today I (And my family, because I am the primary cook) begin a vegan diet. I googled “vegan breakfast@ and came upon this recipe. I’m running out to Whole Foods to restock my kitchen and am looking forward to making this my first recipe. Being a cook my entire life and finding lately meat and dairy turn me off I welcome the change and excited at the challenge of making vegan magic in my kitchen. I’m so excited and feel better just thinking about it! After breakfast I plan on finding out who these “famous vegan chefs” are and their recipes! Good luck! This happened to my family and I recently as well when we watched “What the Health” on Netflix. We all became vegan around October 2017- my husband, 3 yr old, 5 yr old and myself. I am also currently 8 months pregnant and was able to get through my pregnancy so far without reverting back. My kids do really well too; they even refuse to eat some things including dessert people offer them b/c its not vegan! I wish you guys just as much success! I just made this recipe for the first time and it was great! I love how this recipe utilized nutritional yeast. I haven’t really used nutritional yeast for other recipe other than “cheesy” flavors. Two thumbs up for that. I’m also happy to use coconut oil; I usually make pancakes and french toast w/ vegan butter. I used this Nine Grain Tuscan loaf from the Target bakery that I’ve had for about a week. Its like a seedy bread, came out great. I was able to get about 8 slices out of the liquid, although the bread wasn’t super big or small. I used regular all purpose flour instead of what was listed because I didn’t have the others. For my milk, I used half Ripple (pea protein) milk and half of So Delicious Coconut milk, only because I ran out of milk and had to run to the store for more. I also added about a teaspoon of vanilla extract. I cooked it on a griddle and it came out just fine. It allowed me to cook it quicker, in 2 batches and it didn’t leave the others cooked earlier cold. This dish is delectable and it is inviting me to eat thank you for sharing. I made French toast today with this concept and it was delish! I had so delicious sweet creamer and used that instead of almond milk. Sprinkled some nutritional yeast and ground flax into the mixture, then cinnamon and nutmeg. Used slightly stale cinnamon raisin loaf cut thick. You made my breakfasts!!! Hi Melanie, I’m so glad you loved the french toast!! Why add the nutritional yeast………. This was delicious! Thank you for sharing! !